Pão de Queijo is Brazilian cheese bread. 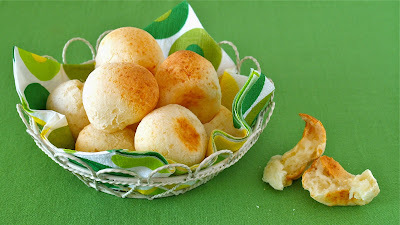 Chewy texture of Mochi and cheese is just like Pão de Queijo. I hope you can try it out! YUMMY!!! 2. Place Shiratamako (lumpy glutinous rice flour) in a bowl. Add milk and mix very well until smooth. *DO NOT add other ingredients before you mix the Shiratamako and milk together. Otherwise, they won't mix well and smooth). 4. Divide the dough into 12 equal pieces using a bench scraper or a knife, then roll them into balls. 5. Bake at 180C (350F) for about 15 minutes. Just out from the oven is good. They stay chewy and soft till the next day. Of course, you can microwave or cook in the toaster oven for a few seconds and they will become soft again.